Figure 9. Is slow motion a unique characteristic of video? Most teachers and instructors would put the effectiveness of a medium for teaching and learning as the first criterion. If the technology is not educationally effective, why would you use it? However, if a student cannot access or use a technology, there will be no learning from that technology, no matter how it is designed. Furthermore, motivated teachers will overcome weaknesses in a particular technology, or conversely teachers inexperienced in using media will often under-exploit the potential of a technology. Design decisions are critical in influencing the effectiveness of a particular technology. Thus well-designed lectures will teach better than a poorly designed online course, and vice versa. Similarly, students will respond differently to different technologies due to preferred learning styles or differences in motivation. Students who work hard can overcome poor use of learning technologies. It is not surprising then that with so many variables involved, teaching and learning is a difficult discriminator for selecting and using technologies. Access (and ease of use) are stronger discriminators than teaching effectiveness in selecting media. Nevertheless, different media have different potential or ‘affordances’ for different types of learning. One of the arts of teaching is often finding the best match between media and learning objectives. We explore this relationship in this section, but first, a little theory, based on a substantial amount of excellent past research on this topic (see, for instance, Trenaman, 1967; Olson and Bruner, 1974; Schramm, 1977; Salomon, 1979, 1981; Clark, 1983; Bates, 1985; Koumi, 2006; Berk, 2009; Mayer, 2009). Embedded within any decision about the use of technology in education and training will be assumptions about the learning process. We have already seen earlier in this book how different epistemological positions and theories of learning affect the design of teaching, and these influences will also determine a teacher’s or an instructor’s choice of appropriate media. When preparing for decisions about technology use, it is useful to make a distinction between content and skills. Olson and Bruner (1974) argue that learning involves two distinct aspects: acquiring knowledge of facts, principles, ideas, concepts, events, relationships, rules and laws; and using or working on that knowledge to develop skills. Again, this is not necessarily a sequential process. Identifying skills then working back to identify the concepts and principles needed to underpin the skills may be another valid way of working. In reality, learning content and skills development will often be integrated in any learning process. Media differ in the extent to which they can represent different kinds of content, because they vary in the symbol systems (text, sound, still pictures, moving images, etc.) that they use to encode information (Salomon, 1979). Different media are capable of combining different symbol systems. Books can represent content through text and still pictures, but not through sound or moving pictures. In this respect, computers in the past have been similar to books, although now they can also incorporate sound and moving pictures (i.e. multimedia). Television and film in the past have been the richest media symbolically. They were the only media which could encompass text, still and moving pictures, natural language, natural movement, music and other sounds, and full colour. Computer-based technology now surpasses television, film and video in this respect, because not only can computer-based technologies such as the Internet represent the same rich media as television, film and video, it can also include animation and simulation, virtual worlds and computerized control of learning. Differences between media in the way they combine symbol systems influence the way in which different media represent content. Thus there is a difference between a direct experience, a written description, a televised recording, and a computer simulation of the same scientific experiment. Different symbol systems are being used, conveying different kinds of information about the same experiment. For instance, our concept of heat can be derived from touch, mathematical symbols (800 celsius), words (random movement of particles), animation, or observance of experiments. Our ‘knowledge’ of heat is as a result not static, but developmental. A large part of learning requires the mental integration of content acquired through different media and symbol systems. For this reason, deeper understanding of a concept or an idea is often the result of the integration of content derived from a variety of sources (Mayer, 2009). Media also differ in their ability to handle concrete or abstract knowledge. Abstract knowledge is handled primarily through language. While all media can handle language, either in written or spoken form, media vary in their ability to represent concrete knowledge. For instance, television can show concrete examples of abstract concepts, the video showing the concrete ‘event’, and the sound track analyzing the event in abstract terms. Well-designed media can help learners move from the concrete to the abstract and back again, once more leading to deeper understanding. Media also differ in the way they structure content. Books, the telephone, radio, podcasts and face-to-face teaching all tend to present content linearly or sequentially. While parallel activities can be represented through these media (for example, different chapters dealing with different events occurring simultaneously) these activities still have to be presented sequentially through these media. Computers and television are more able to present or simulate the inter-relationship of multiple variables simultaneously occurring. Computers can also handle branching or alternative routes through information, but usually within closely defined limits. Subject matter varies a great deal in the way in which information needs to be structured. Subject areas (for example, natural sciences, history) structure content in particular ways determined by the internal logic of the subject matter. This structure may be very tight or logical, requiring particular sequences or relationships between different concepts, or very open or loose, requiring learners to deal with highly complex material in an open-ended or intuitive way. If media then vary both in the way they present information symbolically and in the way they handle the structures required within different subject areas, media which best match the required mode of presentation and the dominant structure of the subject matter need to be selected. Consequently, different subject areas will require a different balance of media. This means that subject experts should be deeply involved in decisions about the choice and use of media, to ensure that the chosen media appropriately match the presentational and structural requirements of the subject matter. Media also differ in the extent to which they can help develop different skills. Skills can range from intellectual to psychomotor to affective (emotions, feelings). Koumi (2015) has used Krathwohl’s (2002) revision of Bloom’s Taxonomy of Learning Objectives (1956) to assign affordances of text and video to learning objectives using Krathwold’s classification of learning objectives. Comprehension is likely to be the minimal level of intellectual learning outcome for most education courses. Some researchers (for example, Marton and Säljö, 1976) make a distinction between surface and deep comprehension. At the highest level of skills comes the application of what one has comprehended to new situations. Here it becomes necessary to develop skills of analysis, evaluation, and problem solving. Thus a first step is to identify learning objectives or outcomes, while being aware that the use of some media may result in new possibilities in terms of learning outcomes. 9.5.3 Pedagogical affordances – or unique media characteristics? ‘Affordances’ is a term originally developed by the psychologist James Gibson (1977) to describe the perceived possibilities of an object in relation to its environment (e.g. a door knob suggests to a user that it should be turned or pulled, while a flat plate on a door suggests that it should be pushed.). The term has been appropriated by a number of fields, including instructional design and human-machine interaction. Thus the pedagogical affordances of a medium relate to the possibilities of using that medium for specific teaching purposes. It should be noted that an affordance depends on the subjective interpretation of the user (in this case a teacher or instructor), and it is often possible to use a medium in ways that are not unique to that medium. For instance video can be used for recording and delivering a lecture. In that sense there is a similarity in at least one affordance for a lecture and a video. Also students may choose not to use a medium in the way intended by the instructor. For instance, Bates and Gallagher (1977) found that some social science students objected to documentary-style television programs requiring application of knowledge or analysis rather than presentation of concepts. 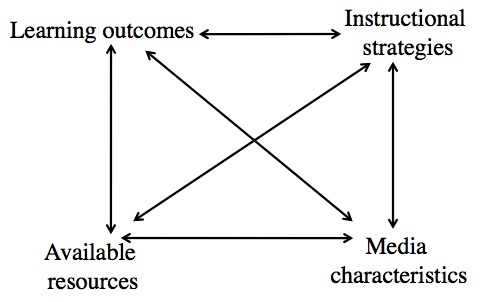 Others (such as myself) have used the term ‘unique characteristics’ of a medium rather than affordances, since ‘unique characteristics’ suggest that there are particular uses of a medium that are less easily replicated by other media, and hence act as a better discriminator in selecting and using media. For instance, using video to demonstrate in slow motion a mechanical process is much more difficult (but not impossible) to replicate in other media. In what follows, my focus is more on unique or particular rather than general affordances of each medium, although the subjective and flexible nature of media interpretation makes it difficult to come to any hard and fast conclusions. I’ve always found media selection a difficult topic. It should be relatively simple to say that text is better for this and audio is better for that, but in practice it’s much more complicated. There is so much overlap and so many other factors that can influence the value of a particular media application other than the ‘pure’ educational affordances. I struggled particularly with the concept of pedagogical affordances of media. It’s the term that is now commonly used, but it doesn’t work for me as a differentiator of media, for the reasons I put in the extract. At the same time, it seems to me that there are important differences between media, and that these are as much to do with the nature of knowledge as they are to do with teaching effectiveness. In other words, there are many different ways of knowing something, and there isn’t necessarily one right way. 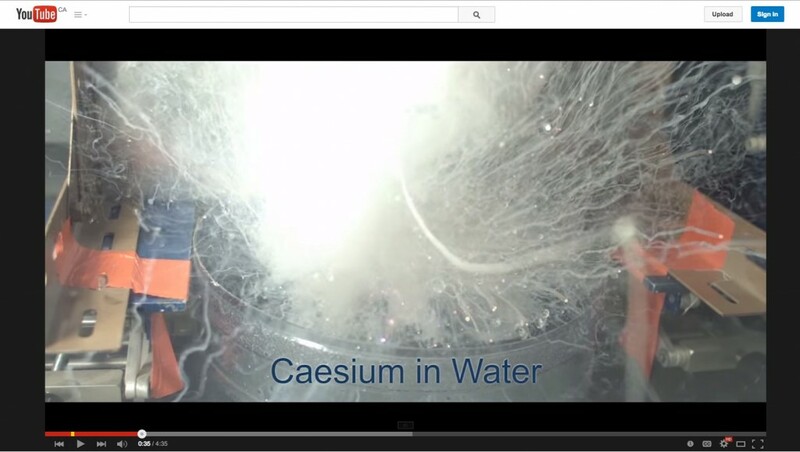 So if I understand what happens when mercury is added to liquid nitrogen from watching a slow motion video, but don’t understand the chemical equations behind it, what is the nature of what I know? This just strengthens my belief that knowledge is dynamic, not static, and multiple ways to present knowledge is necessary for true understanding. And that academic knowledge is somehow different, and this impacts on what media are ‘valid’ in teaching. But what are your views on this? In particular, am I going down a very long and dark alley leading to nowhere in this chapter? Koumi, J. (2006) Designing video and multimedia for open and flexible learning. London: Routledge. I was certainly eager to read on and see how you would tie affordances and pedagogy into each medium, so I think you’re headed in the right direction! Worst thing that could happen is that you might find “unique” doesn’t work.